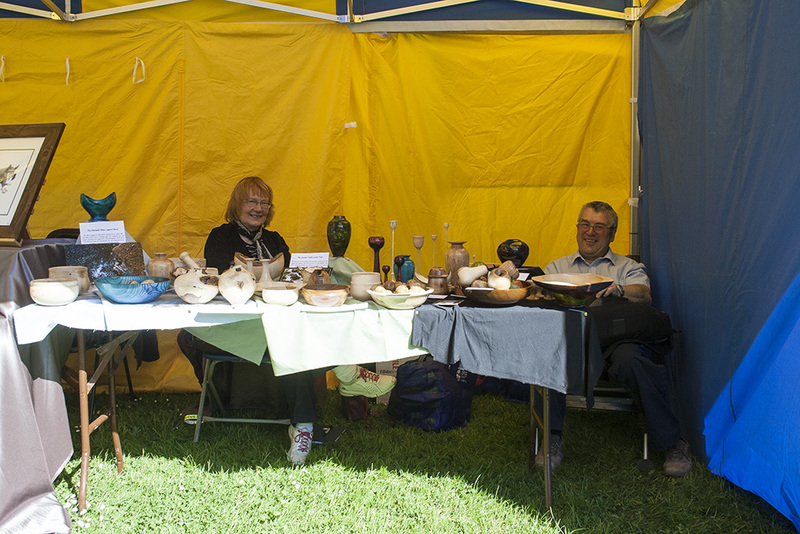 As I got back to the stall Jenny was in the process of making the first sale of the day, my prized item, a dark coloured hollow form vase. We did very well for the day covering our costs and even covering some material outlay for the workshop equipment too. All in all an excellent day which was only slightly marred by the odd disappearance of a rather nice Thuya Burr & Ebony finial box which, not only was I therefore unable to sell, but I don't have any photo's of it either, I had thought perhaps I left it at home, but when I got back it isn't here, so that's a perturbing mystery. Here is a nice shot taken by Jane of us at the very beginning of the day after we had set up. I would like to say thank you to all the nice people who bought the items from me, I enjoyed meeting and talking to you, and even to those who enjoyed a chat but were not tempted!